Read about some of the most famous volleyball players. We introduce the best volleyball players in the world – from the past and present. Our profiles present some of the most recognized volleyball figures – both beach volleyball and indoor volleyball. We feature some of the best volleyball players in the world currently - for example beach volleyball players Misty May (USA), Kerri Walsh (USA). We introduce indoor volleyball players Ekaterina Gamova (RUS), Giba (BRA), Ivan Miljkovic (SRB), Logan Tom (USA), Yumilka Ruiz Luaces (CUB), Taismary Aguero (ITA) among others. Certainly we’ll take a close look at the greatest volleyball players from the past, including Dimitri Fomin (RUS), Joel Despaigne (CUB), Andrea Zorzi (ITA), Karch Kiraly (USA) etc. Karch Kiraly (USA men’s) – the Most Famous Volleyball Player? Karch Kiraly (who was named 'Greatest Volleyball Player of the Century' by FIVB, the international governing body) is the most recognized recent volleyball player in the world and arguably the best player ever lived. Kiraly retired his successful career in 2007 as three-time Olympic gold medalist (1984, 1988 indoor champion; 1996 beach volleyball champion). Karch Kiraly is the only player who has won both indoor and beach volleyball Olympic gold medal – and perhaps will be the only player ever to reach gold medal in both sports. Find Karch Kiraly Profile and Volleyball Quotes down below. Some of the current famous volleyball players who could reach winning several gold medals are American beach volleyball players Misty May and Kerri Walsh. They have been dominant in beach volleyball for several years - won the gold medal at the 2004 Athens Summer Olympics and are looking forward to repeat it at Beijing Summer Olympics 2008. Misty May and Kerri Walsh had an extraordinary 89-match winning streak in 2003-04, then collected 50 straight match victories from the Olympics until July 2005. They are almost unbeatable – they don’t lose many matches in the whole season. Our selection for the best volleyball player in the world is our long time favorite volleyball player Cuban Yumilka Ruiz Luaces (shirt name Ruiz), captain of the Cuban women’s volleyball team. This high-flying woman is in her own class with her amazing jumping ability. 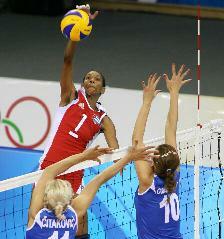 She is a very experienced player and has represented Cuba in several international competitions. And you’d better believe us; she is a fantastic player and lots of fun to watch. Keep her name on your mind and pay attention to her in Olympic Games and World Championships. Well, you don't have to worry about memorizing her name; we promise you don’t have any problems locating her. Just find the player who jumps the highest! Yumilka Ruiz can fly! She has a very impressive vertical jump, our wild guess is - around 1,07 meters (42 inches). Read more about Yumilka and her teammates down below under "Successful Olympic Volleyball Players". 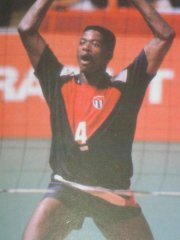 Giba is arguably the most recognized volleyball player among the fans all over the world. Giba and his superb Brazilian men’s national team have virtually won everything since year 2001. His charisma and energy combined with the finest volleyball skills make him likable player everywhere. Giba is a fairly short outside hitter (192 cm, 6'4) in today’s volleyball, but replaces the missing reach with great skills and leadership which have contributed to make the Brazilian National Team of 2000's one of the best volleyball teams teams ever. Read more about Giba down below under "Professional Volleyball Players." Read about one of the most famous volleyball players, whose character is a great source of motivation and inspiration to all the volleyball fans. Read about the best beach volleyball players. Bios of few legends and uprising stars in Beach Volleyball. Read about the best volleyball players in the world - a couple of star players and Olympians from the world's top volleyball team. Introducing more top female volleyball players. Introducing the members of the most successful volleyball team ever. Read about superstar who is loved by volleyball fans all over the world. Read about coaching legend who has led nearly unbeatable team in 2000's. Read about coaching legend who became famous for his achievements and outstanding coaching style. Best Volleyball Teams - Which are the Best Teams? Which are the most successful volleyball teams ever?